A Saturday drive took us to the town of Świebodzin where they’ve erected the world’s largest Jesus statue. 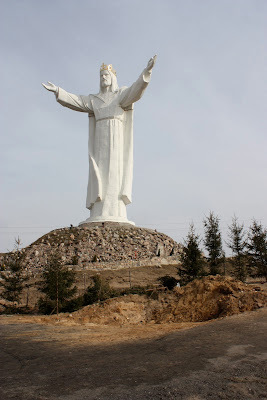 The figure is 33 meters high, one meter for every year of his life, I was told. When you add in 3 meters for the crown and the height of the mound, it’s taller than its well known counterpart in Brazil. Construction took five years, with a cost of $1.5 million. The project was envisioned and led by a retired Polish priest. Funding came from the local residents and from as far away as Canada. I applaud their vision and commitment to seeing the statue completed. The Jesus statue can be seen from the Berlin – Warsaw express train. The conductor usually alerts passengers, who will snap photos of the statue on the horizon, in what appears to be the middle of nowhere. My husband commented as we walked back to our car, that everyone was looking at it, taking a picture, and then leaving. Its kind of like the Grand Canyon in that regard. The American in me is surprised that there isn’t more to go with this statue, a chapel, a gift shop, a cafe. I would expect to find things that would make the Świebodzin Jesus statue more of a destination. Things that would make people linger, a beautiful quiet place to pray, a place to acquire a memento of the visit, or to relax over a cup of coffee and chat about what you’ve just seen. I’ve read of no plans to add any of these things. 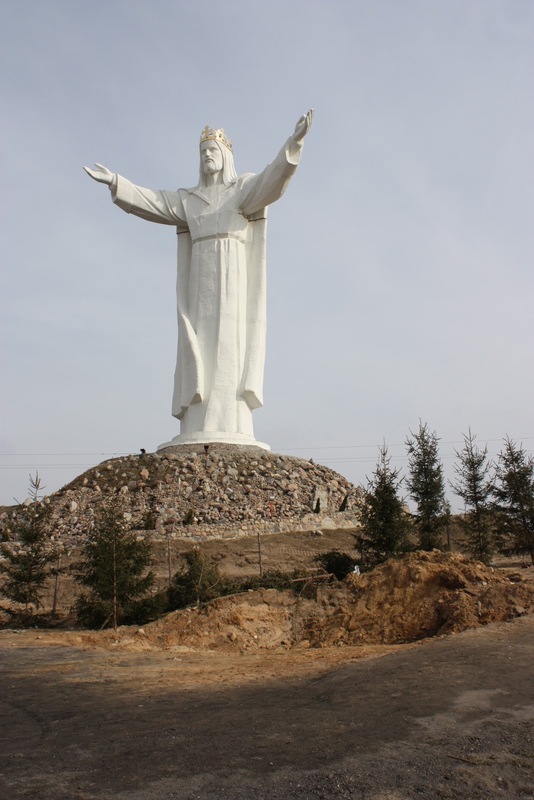 It remains the highest Jesus statue according to the Guinness Book of World Records. As I said, it’s the American capitalist in me that wants to see more. Even the church where I’m now employed has a gift/book shop. Are you surprised that we would drive 90 minutes just to snap a photo and leave? Let’s just say that there is also a golf course nearby.